Physiologically, sight is initiated when reflected light of different wave lengths: colour, hit the eye. We have the bottle before us, the glass is filled (no more than a third up), the reflected light in different colours hits the external surface of the eyeball: The Cornea, travels through the lens and inwards through the Vitreous Humor, to hit the Retina, the innermost layer of the eye ball. The Retina consists of nerve tissue, Photo-receptors that sense the light entering the eye, and start translating it as the images of our vision in the form of shape and colour in the brain. 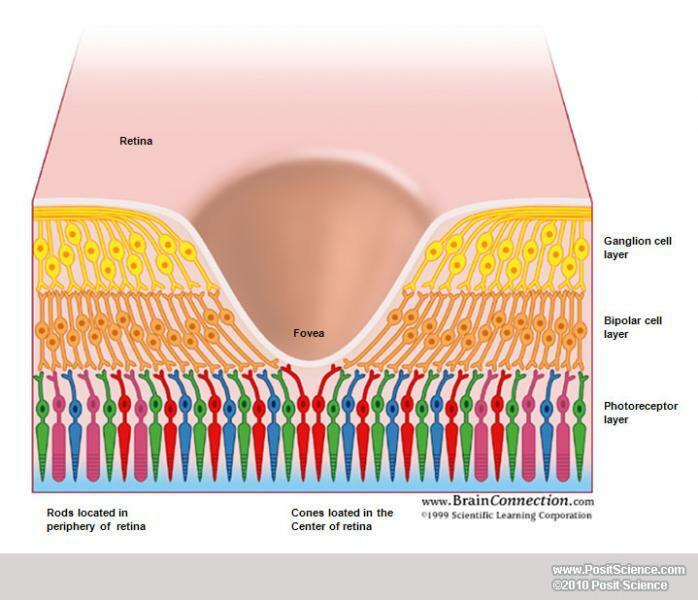 Photoreceptors are specialty cells in the Retina, they allow us to see shapes, colors and the combination of both, something we all take for granted. 1. Rod cells: These function only in dim light and are blind to colour. Only the highest-intensity output gets through; so contrast and visual definition are improved. 2. 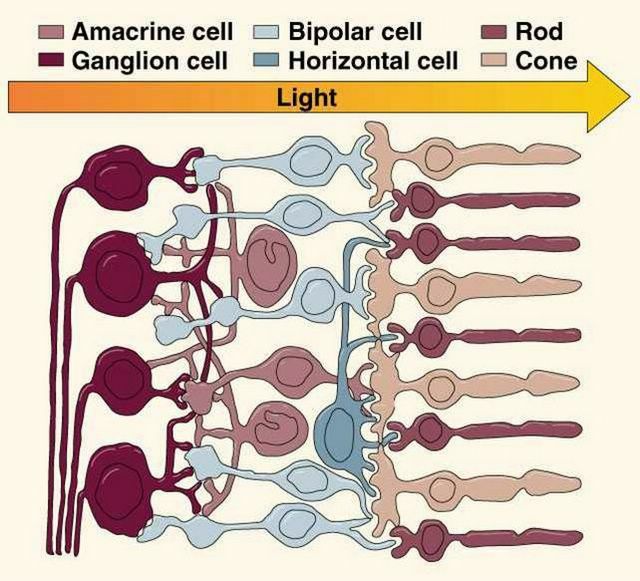 Cone cells: The other kind of photoreceptor cell. There are three different types of cones, sensitive to different light wave lengths (Red Green & Blue). The cones operate in bright light and are responsible for high acuity vision, as well as ability to “see” colour. 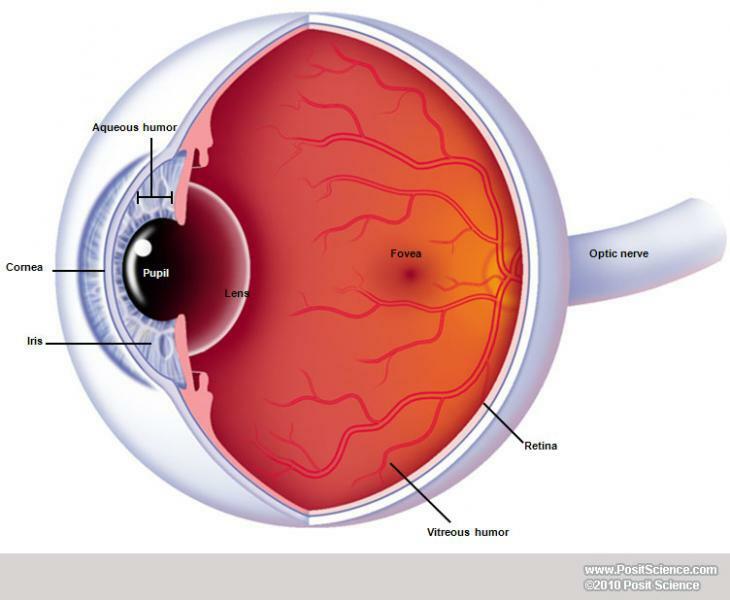 Rods and cones form an uneven mosaic within the retina; there are 10 times more rod cells than cones. Rods are concentrated at the outer edges of the retina. 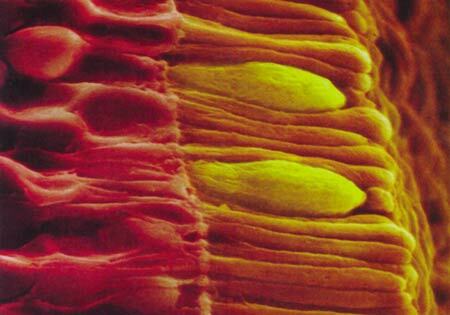 There are approximately 130 million rod cells in the human retina. Rod cells are almost entirely responsible for peripheral and night vision. They are 100 times more sensitive to a single photon than cones so rods require less light to function than cones and allow us to see in the dark. Single Rod cells collect and amplify light signals. However, this convergence comes at a cost to visual acuity / resolution, because the accumulated information from several cells simultaneously is less accurate than information from each rod cell individually. But that will have to do since we look at wine under good light conditions and not in the dark. The first kind of cone responds to red colour (light of Long wavelengths – L around 564–580 nm); The second type responds to green colour (Medium wavelength – M, 534–545 nm), The third type responds to blue colour (Short wavelength – S, 420–440 nm), The difference in the signals received from the three cone types in varying degree of stimulus strength which allows the brain to perceive all possible colours. 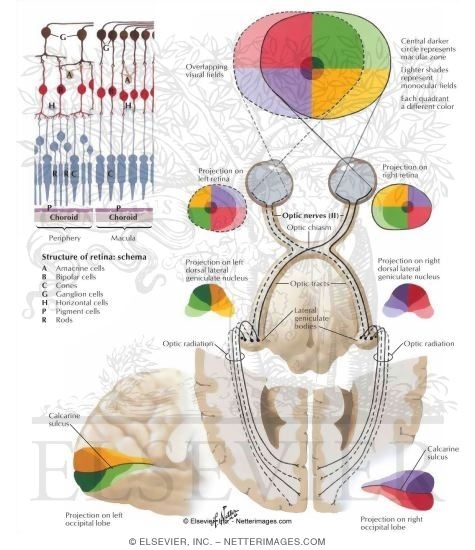 The brain combines the information from each type of receptor to give rise to different perceptions of different wavelengths of light and ultimately the correct colour. Wine comes in a wide variety of colours shades and hues. It is these receptors and the wonders of the final interpretation of these signals into what we call sight, in our brain, will allow us to distinguish between different grape varieties, wines from different regions, wines in different state of evolution and wine making methods just by mere sight, with no other senses involvement. Several theories explain the mechanism of colour vision, Helmholtz’s trichromatic theory & Hering’s opponent process theory, they differ on the exact point colour processing actually begins, either within the receptor cells in the retina or slightly behind it, at the level of retinal ganglion cells and beyond. Visual information is then sent to the brain from retinal ganglion cells via the optic nerve to the optic chiasm: a point where the two optic nerves meet and cross each other. Information from one visual field crosses to the other side of the brain to the visual cortex. Cone cells allow us to stabilize the colour constancy of an object, so when we look at red wine we preserve an ability to see the true colours of our object for instance red wine in different hues and shades. The wine clarity is wine easily examined at a slight tilt under clear light conditions either with the background of a white paper or a well lit background. And brightness is reflected from it. Fresh wine should have a clear spark ‘sneaky’ kind of wink and it looks sleek and shiny. 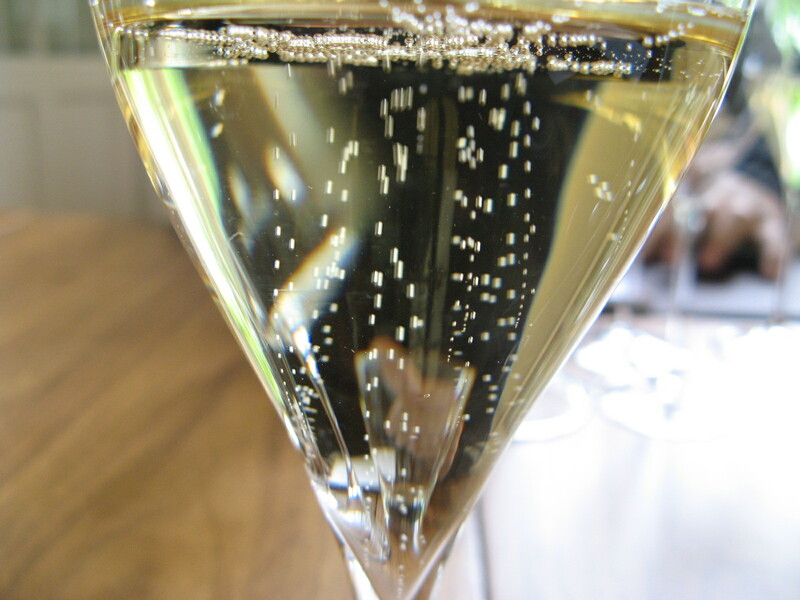 Brilliant or Crystalline: perfect transparency; the surface of the wine reflects the light with a sparkle. Wine, whatever its category should be clear, perfectly transparent and free of foreign deposits or suspended particles, most suspended particles are wine deposits and are not associated with wine faults. Signs of cloudiness may indicate a defect. A fine wine of any color at its prime should be not only clear but also bright with a luminous quality. Type of Wine – Obviously, different types of wines will have dramatically different wine colour..White wines tend toward the more clear yellow and gold end of the spectrum while red wines can vary from light red to deep purple. Rosé wines are somewhere in between. Additionally, your expectation of what a wine should look like depends on the type of wine in question. 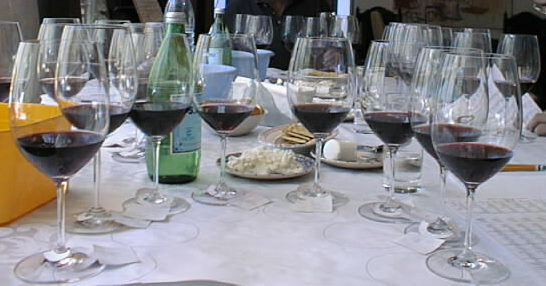 For example, while many Cabernet Sauvignon, based wines will be dark purple or even close to opaque, Pinot Noir-based wines tend to be lighter with less depth of color and a lighter hue. Is the color of the wine appropriate for the type of wine you taste? You will learn this as you go along and get more experience with different types of wines. Colour is simply light of different wavelengths and frequencies that we can actually see and is made up from photons, reflection of light from the wine (as our object) is what we see in form, shape, and colour with its inner diversity of different hues and shades. .
Wine colours, originate from the grape’s skin. Grape juice from red or white varieties is usually transparent (clear to cloudy). Anthocyanins are the chemical compounds that give wine white or red its colour, or pigment. Different “exposure” to grape treatments like: amount and type of crushing, which exerts colors into the liquid. Changes in temperature, contact of broken skin with the juice, exposure to oxygen, fermentation with or without the skins (lees), length of fermentation, type of tanks: barrel or steel, etc. All of these factors change and affect the wine’s colour, which keeps changing even after bottling, as aging affects the depth and hue of the basic color of each wine. Different grape varieties contribute different hues of white yellow or red as described below. Polyphenols contribute to the yellow colour of white wines, phenols concentration in different grape variety varies: level of phenols in the Riesling grape is very low hence they appear almost transparent, Chardonnay on the other hand due to high phenolic concentration will appear darker : yellow lemony colour. Apart from phenols, maturity level of the grape will also affect the colour. The riper the grape, the darker shades of yellows in white wines. 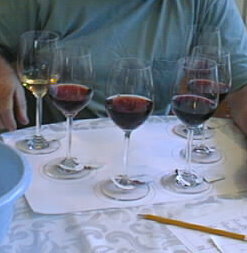 The colors of the wine can vary strongly depending on age, concentration and wine making techniques. Colour of white wines deepens with age, tending toward full straw or pale gold. More mature dry wines, particularly if aged in wood, take on rich golden tones, sometimes even with hints of copper or brass. Brown hues are a sign of over oxidation, (a defect in wine), but in certain fortified wines such as Marsala, it is a normal feature. Hints of red in a white wine are usually indications of a fault. The grapes and wines below, usually exhibit the listed colors. Clear with a greenish tint-: Indicative of young wines with residual chlorophyll, mainly from cold growing regions: Chardonnay from Chablis, German Rieslings, and young New Zeeland Sauvignon Blanc . Amber Tawny: typical of OLD dessert or wines made from partially dried grapes. Also the unhealthy shade of oxidized wine. These colours are an indication to the content of the glass on the eye level, well before our nose or taste buds go into wine tasting action! 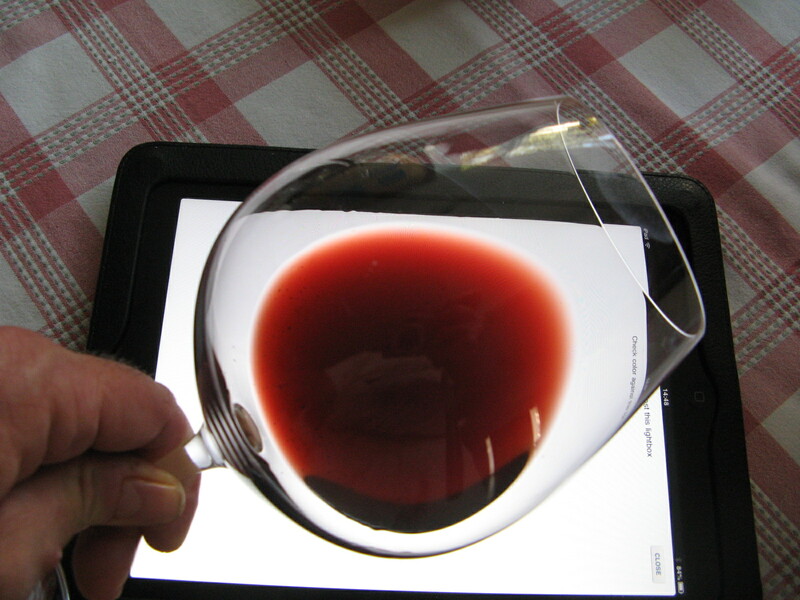 Wines exhibiting colours beyond their expected, ordinary hue may already be “suspected” of a fault of some sort either in the winemaking process, or more likely in their maturing state. Above is the colour of the 1962 Maison Noemie Verneaux Mersault Charmes, we opened (a magnum) the wine forty years old now!!! was slightly oxidized but still drinkable! This was its colour, (between us from now on I will photo real wine colors and exchange the colours above, with them! 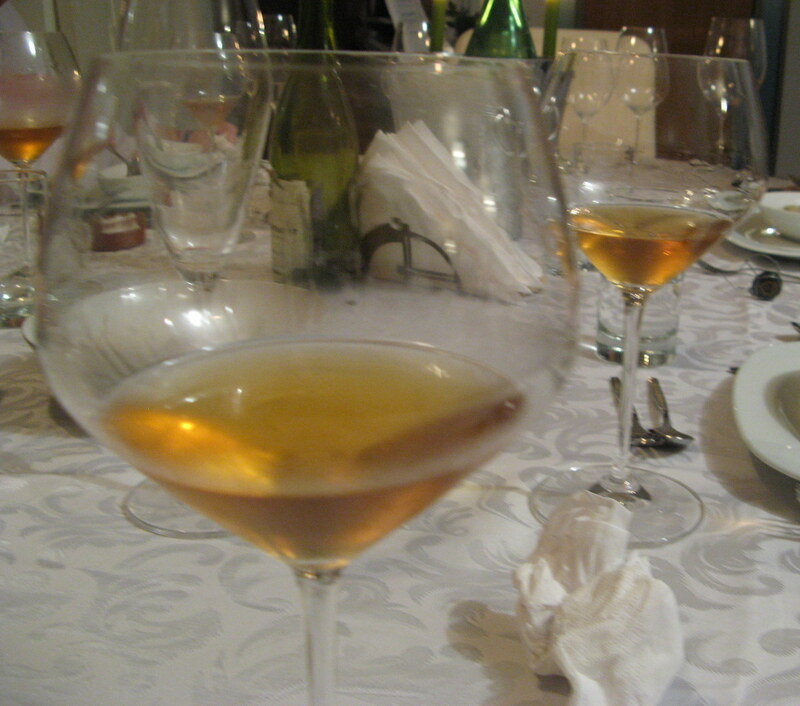 ), I would say it falls between deep “old gold” and Amber what a delightful robe adorns these wineglasses. King James Bible (Cambridge Ed) Look not thou upon the wine when it is red, when it giveth his colour in the cup, when it moveth itself aright. Holman Christian Standard Bible : Don’t gaze at wine because it is red, when it gleams in the cup and goes down smoothly. International Standard Version: Don’t stare into red wine, when it sparkles in the cup and goes down smoothly.